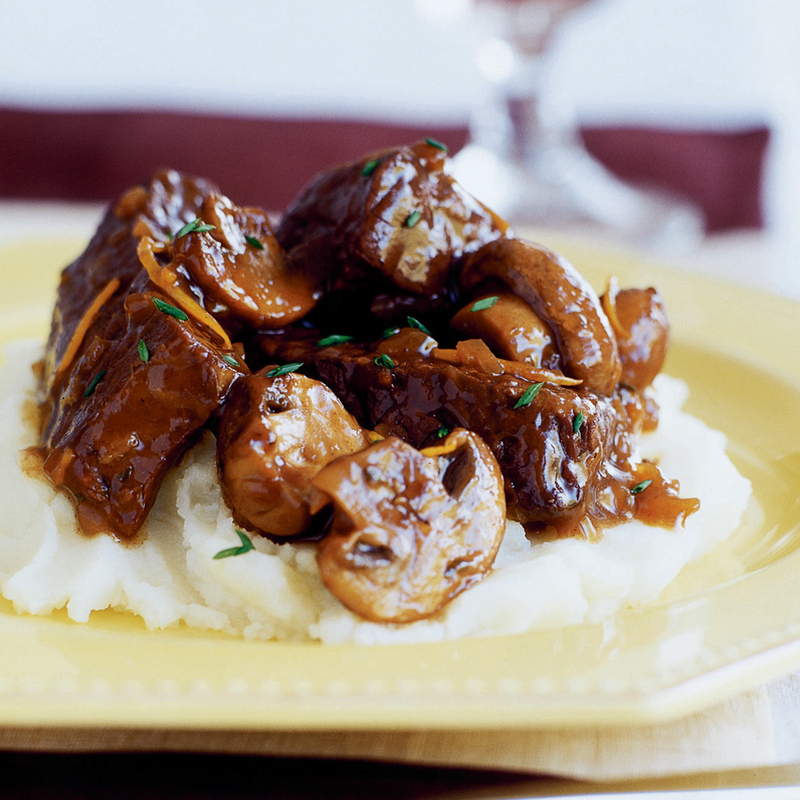 Subtle Asian flavors like ginger, Chinese five spice, and soy sauce join short ribs and mushrooms in the for an easy, fragrant beef stew. Serve this hearty, comforting beef dish over a bed of jasmine rice or mashed potatoes--you'll definitely want something to soak up the rich sauce. If you do not have port or cream sherry on hand, you can simply increase the amount of red wine by 1/2 cup as a substitute. Rinse meat; cut into 3- to 4-inch lengths (for chuck, about 1 in. thick and 1 1/2 in. wide) and place in a 5- to 6-quart slow-cooker. With a vegetable peeler, pare orange part of peel from orange and sliver it; save orange for other uses. In a 1 1/2- to 2-quart pan, combine peel, onion, 1 cup broth, wine, port, vinegar, soy sauce, thyme, ginger, and five spice. Bring to a boil over high heat. Pour liquid over meat. Turn slow-cooker to high, cover, and cook until meat is very tender when pierced, 5 to 6 hours. Rinse and drain mushrooms; trim off and discard stem ends. Cut mushrooms in half lengthwise and place in a 10- to 12-inch frying pan; add butter. Skim off and discard fat from liquid in slow-cooker. Ladle 1 cup liquid into pan with mushrooms. Stir mushrooms often over high heat until liquid has evaporated and mushrooms are lightly browned, 13 to 17 minutes. With a slotted spoon, lift meat from juices in slow-cooker and lay in a single layer in a shallow casserole (about 9 by 13 in.). Pour mushrooms over meat. Bake in a 375° regular or convection oven until meat is sizzling and browned, 12 to 15 minutes. Meanwhile, measure remaining liquid from slow-cooker. If less than 2 cups, add beef broth to make 2 cups, pour into a 2- to 3-quart pan, and bring to a boil over high heat; if there is more, pour into pan and boil, stirring occasionally, until reduced to 2 cups, 8 to 12 minutes. In a small bowl, mix cornstarch with 1/4 cup water. Pour into boiling liquid and stir until thickened, about 30 seconds. Pour evenly over meat and mix gently to blend with liquid in casserole, adding salt and pepper to taste. Sprinkle with chives.